Family Christmas Traditions to start with your family this year. Do you have family Christmas traditions that your family looks forward to each year? Family traditions are surprisingly easy to start. All that’s required is to repeat the same activity year after year. In a relatively short few years, your family will come to expect the same activities to be repeated, which creates memorable Christmas traditions. If you have a young family and you’re just starting out together, or if you’re looking for some new family Christmas traditions to start, here are some ideas. I thought I would start by sharing a few of the traditions our family has enjoyed through the years. Every year, usually the day after Thanksgiving, we decorate the house together. We dig out all the Christmas boxes, put on some Christmas music, and decorate! 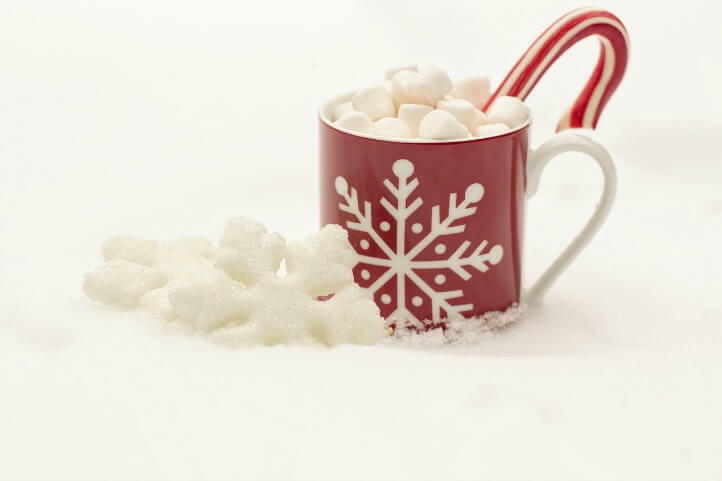 To make it even more fun, we’ll often have a special treat and hot cocoa to enjoy. Everyone looks forward to our decorating party. For years, we’ve made it a habit to make or buy a new ornament for the tree. There have been years where the kids each made an ornament, and then there are other years where we buy one. Last year we were at an amusement park in December, and we bought a family ornament there with every family member’s name on it. It’s a favorite now! You can get one of these personalized Christmas ornaments here. 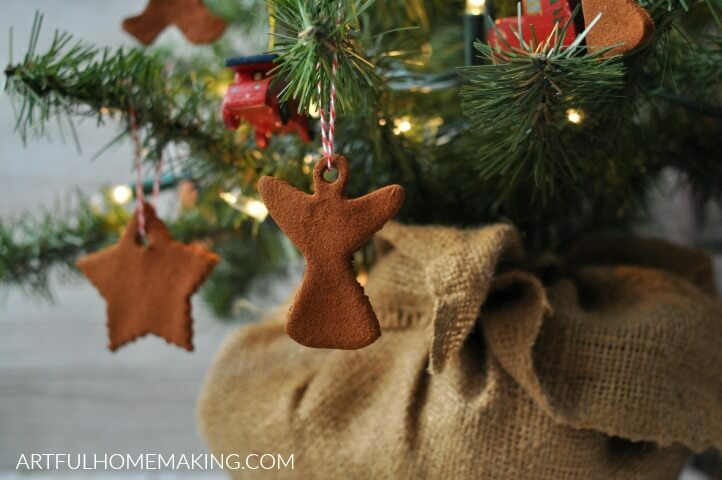 For a handmade ornament idea, try these! 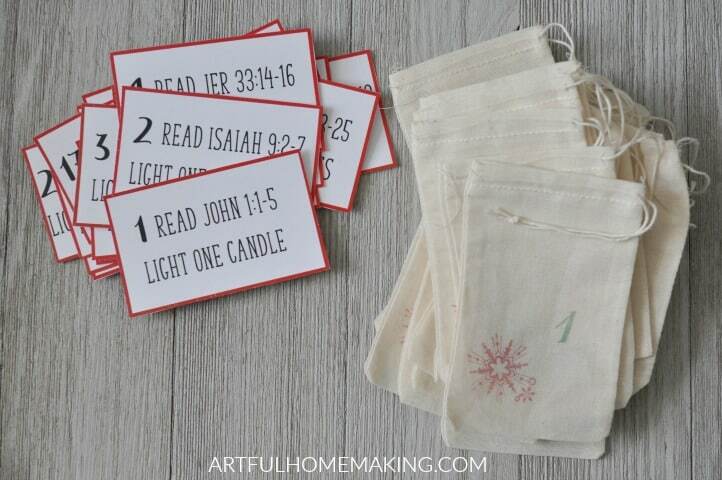 Every year we use some sort of Advent calendar and also do daily Advent readings every evening. Our Advent readings always include the lighting of candles, and this has become a special tradition for us each year. Here’s a free Advent calendar if you need one. This is a tradition I started when all of our children were very young. We’ve been doing this for so many years now! You can see how we keep this simple by making no-bake gingerbread houses with graham crackers here. You can also make this even easier by just buying a gingerbread house kit! Another tradition I started when our kids were little was making Christmas cut-out cookies (here’s our favorite recipe). We have a wide assortment of cookie cutters and we love making these every year. Christmas picture books are my favorite. There have been years that we even wrapped the books and used them for a picture book advent calendar, and then other years we just read them. No matter how you decide to do it, Christmas books are sure to create lasting Christmas memories. Here’s a list of our favorite Christmas books. Every year we pick at least one night to watch a Christmas movie together. It makes it extra-special to watch a movie by the tree light with popcorn and hot cocoa. Several years ago, we started a tradition of going to a nearby city and going ice skating in December. Even though we’re not all great at skating, it’s so festive to be at an outdoor ice rink surrounded by lights and Christmas music playing. 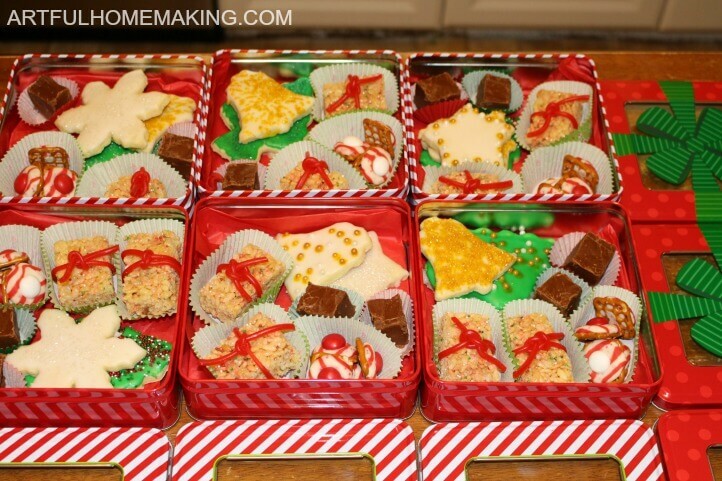 A few years ago we started a tradition of making treat boxes for our neighbors, filled with our favorite Christmas goodies. The kids love getting to be part of reaching out to the neighbors in this way. This is one of my favorite traditions. We haven’t always had a church that did a candlelight service, but it’s such a special tradition for Christmas Eve. For quite a few years I made a variety of food for our Christmas Eve dinner. A few years ago, I heard Sally Clarkson talking about their traditional Christmas Eve “Shepherd’s Meal,” and we decided to adopt this as our own family tradition. I make this potato soup and set out a wooden tray full of a variety of nuts and nutcrackers. The kids snack on nuts while I’m finishing up the meal. We also make a special fruit salad. When all of the food is prepared, the table is set with a nice tablecloth, candles, nuts, soup, and fruit. We use the special glasses and fill them with sparkling cider. We eat by candlelight as we ponder the Christmas story and enjoy eating a quiet meal together. It’s always a special time and creates sweet memories. My husband and I both came from families who opened gifts on Christmas Eve and then had the stocking as a surprise on Christmas morning. So, we’ve continued that tradition in our own home. On Christmas Eve, we have our special Christmas dinner, and then we take pictures by the tree before opening presents. I love looking back on these photos! When my kids were younger, I made them matching Christmas pajamas to wear on Christmas Eve, which is another tradition I love. Every Christmas for years, I’ve made cinnamon rolls and an egg casserole like this one for breakfast. Both of these can be made in advance, and the whole family looks forward to them. This is just a list of all the things you hope to do in the month of December. This is a great way to involve your kids and your spouse in the new traditions you’re trying to start. Take note of the activities you especially enjoyed doing, and they may become a new tradition for years to come. 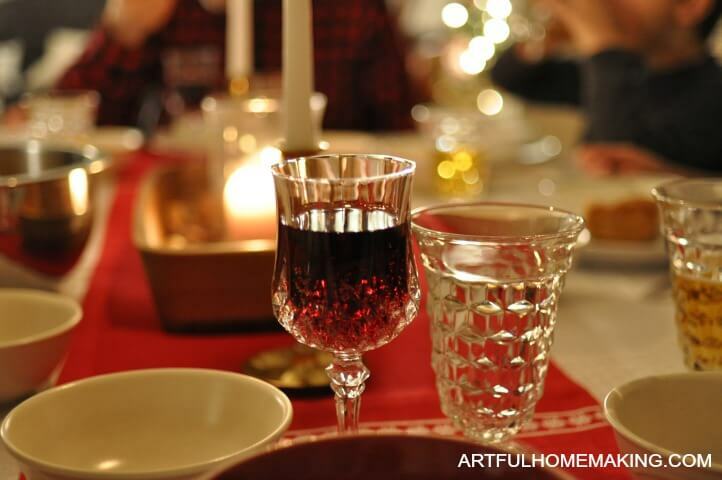 What family Christmas traditions does your family enjoy? Which ones are you hoping to start? I love this so much! I always feel warmed and encouraged after reading your posts, especially this kind! I love each idea, and want to say thank you for everything you put out for us to enjoy. It truly is a blessing. Warmest wishes from out family to yours this holiday season! Thank you so much, Savanna! It’s always such an encouragement to hear from you. I hope your family is having a lovely holiday season as well! Thank you for sharing these great ideas. Found you at Reader Tip Tuesday.